The State Department faces a 28 percent cut, and the EPA could lose 31 percent of its funding. President Trump will formally unveil a budget plan on Thursday that makes good on his campaign pledges to rebuild the military, crack down on illegal immigrants, and construct a wall along the southern border with Mexico while slashing spending on foreign aid, environmental enforcement and scores of other domestic programs he derided throughout the 2016 campaign. “This is the ‘America First’ budget,” White House Budget Director Mick Mulvaney said Wednesday, invoking Trump’s signature campaign theme while asserting that the budget document directly reflects the priorities Trump established on the campaign trail. “There’s no question this is a hard-power budget, it is not a soft-power budget, Mulvaney said. Trump’s fiscal 2017 and 2018 budget blueprint – which is subject to congressional approval -- would boost defense spending this year by an additional $30 billion and by another $54 billion in the fiscal year that begins next October 1 – a roughly 10 percent increase. The budget would also shower the Department of Homeland Security and immigration and border patrol agencies with billions of fresh dollars aimed at stemming the flow of illegal immigrants into the country and blocking the flow of refugees from the Middle East and other countries. The budget also makes the first down payments on the cost of building a wall along the border with Mexico. That will begin with a relatively modest $1.5 billion appropriation this year, a small fraction of the estimated $25 billion overall cost that was Trump said would be paid by Mexico. That would be followed by an additional $2.6 billion in fiscal 2018, to provide the administration with time and resources to design the wall and set a construction timeline for arguably Trump’s most expensive and controversial infrastructure project. At the same time, Trump is proposing a series of deep cuts in other programs to offset the cost of his national defense and homeland security efforts and to begin to whittle away at what the president insists is a bloated and entrenched federal workforce. Stephen K. Bannon, Trump’s White House senior adviser, has boasted that Trump would lead a “deconstruction of the administrative state,” and the president’s budget seeks to make good on that boast. Among programs targeted for deep cuts or elimination: The Corporation for Public Television, the Legal Services Corporation, AmeriCorps and the National Endowments for the Arts and the Humanities, with public television funding slated to be zeroed out. The Environmental Protection Agency, which led the Obama administration drive to combat climate change, would see its budget cut by 31 percent, or roughly $2 billion, which would force the layoffs of about 3,000 employees. The administration will also seek $6 billion in cuts at the Department of Housing and Urban Development, a move that would greatly diminish public housing support and end most federally funded community development grants. One of the deepest cuts of 28 percent would be made in the State Department – a jarring setback for Trump’s new secretary of state, Rex Tillerson, the former Exxon Mobil chairman and CEO. Mulvaney insisted yesterday that this in no way reflected the president’s view of Tillerson’s performance and that the bulk of the savings would come from the foreign aid program. Related: A Military Buildup and Big Tax Cuts: Is the Debt Set to Soar Under Trump? While bulking up spending on defense, homeland and border security, veterans’ benefits, law enforcement and private and public school choice, the administration pursued dollar-for-dollar offsetting cuts in domestic programs that were given a low priority by the new president. 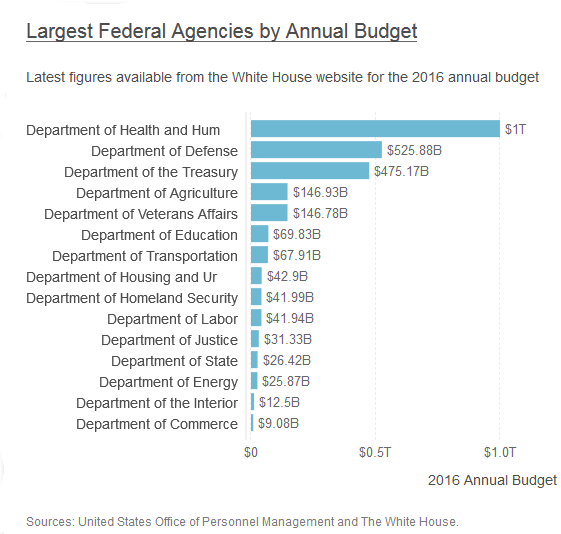 Mulvaney recently revealed that Trump’s 2018 budget “blueprint” would allocate $603 billion towards “top line defense discretionary” funding, or a $54 billion increase over the Budget Control Act spending caps. Yesterday Mulvaney said the administration would seek $30 billion more for defense and border security this year as part of an unfinished fiscal 2017 appropriations package. The so-called preliminary “skinny budget” is missing many crucial details that won’t be known until later this spring, including overall projected spending, revenues, interest on the debt and the fate of major entitlement programs including Social Security, Medicare, Medicaid and other costly entitlement programs that are the biggest drivers of government spending and debt. The federal government is currently projected to spend a little more than $4 trillion next year, with roughly two-thirds going to Social Security, Medicare and other entitlements and interest on the nearly $20 trillion national debt. The Congressional Budget Office currently forecasts that fiscal 2018 spending will exceed revenues by $488 billion, more deficit that will be piled onto the debt. Despite his frequent promises to address the rising deficit and debt, Trump’s new budget plan does nothing to shrink the deficit next year. If anything, his drive for major tax cuts for businesses and individuals, new infrastructure construction including the southern wall, expanded access to charter schools and other initiatives will likely drive up the debt even more. Moreover, there is considerable uncertainty over whether Trump and congressional Republican leaders will make good on their campaign pledge to repeal and replace the Affordable Care Act, and what impact that will have on millions of Americans reliant on Obamacare’s subsidized private insurance policies and expanded Medicaid for their coverage. However, critics say that even with only sketchy information about Trump’s intention to effectively shred social safety net programs while escalating defense spending well above the legal discretionary spending caps under the 2011 Budget Control Act, the new administration appears bent on imposing devastating cuts to domestic social programs that have long enjoyed bipartisan support on Capitol Hill. Non-defense discretionary spending on such things as education, job training, research and development as well as operating costs for federal agencies already have been reduced significantly since 2010 under the Budget Control Act and would have been deeper if it hadn’t been for the intervention of Congress, according to the liberal-leaning Center on Budget and Policy Priorities. Under existing law, non-defense discretionary spending is due to fall 16 percent below its 2010 level in 2018. If Trump prevails with his budget proposal, the cut will deepen to 25 percent. Trump has vowed not to cut Medicare or Social Security as part of his efforts to restrain spending – at least for the time being. That will put even more pressure on his policy advisers and cabinet members to find additional savings in domestic programs which constitute about a third of the overall federal budget, including food stamps and welfare assistance. Trump’s Government Reorganization: Hatchet Job, or Just Major Surgery?